Finance Twitter : Abdul Hadi Awang, the president of PAS (Pan-Malaysian Islamic Party), had taken at least RM90 million bribes from UMNO. Where’s the proof? Instead of proceeding on a defamation suit against Sarawak Report editor Clare Rewcastle-Brown, the supposedly holiest Muslim man in Malaysia has chosen the coward’s way out – an out of court settlement. Where is dignity of PAS? Amanah asks after suit withdrawal. Clare Rewcastle-Brown, the former BBC journalist who is considered a heroine in Malaysia for her exposure of crooked Najib Razak’s 1MDB scandal, said she is satisfied with the out-of-court settlement with Hadi Awang since it did not require the article at the centre of the RM90 million to be altered or removed, let alone issuing an apology. “I stood my ground. I am very pleased with the outcome as I am entirely vindicated by the fact that Hadi has dropped this case against the article which remains unaltered and online. I want to thank all the people who supported me in standing up to this attempt at legal bullying by PAS,” – said Ms. Clare, obviously happy that she had checkmated and gamed Hadi at his own game. 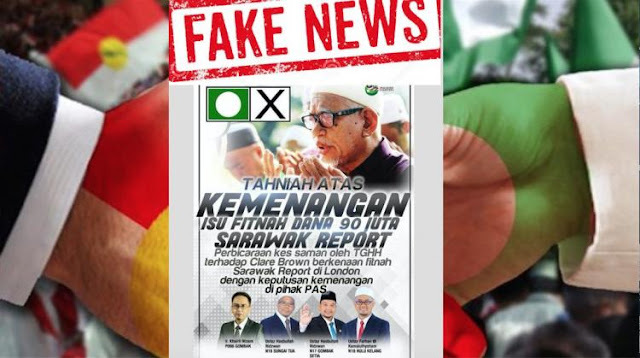 Yes, the highly explosive article published in Sarawak Report dated August 6, 2016 – accusing that Najib had bribed Hadi and his minions with RM90 million ahead of the May 9 election last year – is still available online. In other words, PAS President Hadi is perfectly alright, not that he could do anything, with the article accusing him of accepting the RM90 million bribery.